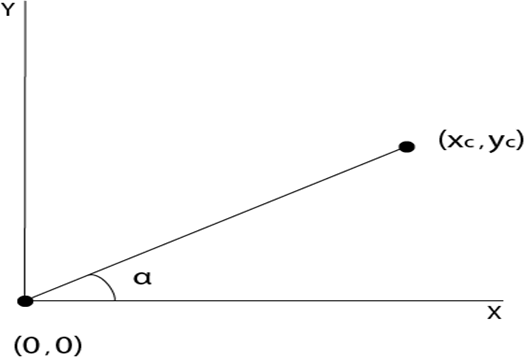 It is a process of changing the angle of the object. Rotation can be clockwise or anticlockwise. 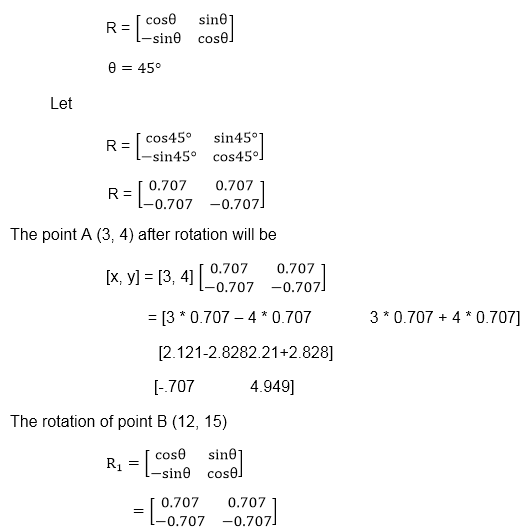 For rotation, we have to specify the angle of rotation and rotation point. Rotation point is also called a pivot point. It is print about which object is rotated. 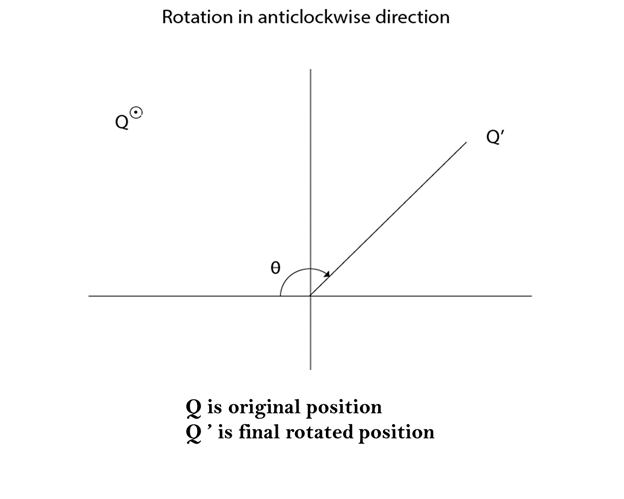 The positive value of the pivot point (rotation angle) rotates an object in a counter-clockwise (anti-clockwise) direction. 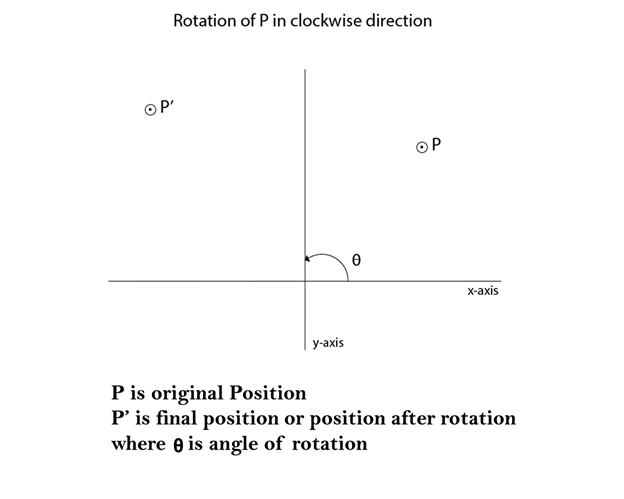 The negative value of the pivot point (rotation angle) rotates an object in a clockwise direction. When the object is rotated, then every point of the object is rotated by the same angle. 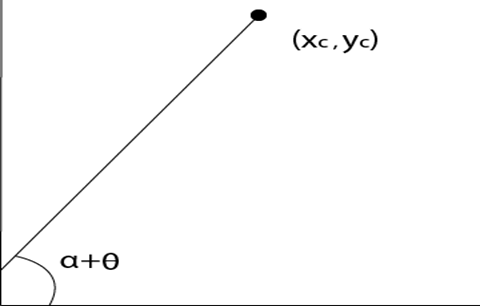 Straight Line: Straight Line is rotated by the endpoints with the same angle and redrawing the line between new endpoints. Polygon: Polygon is rotated by shifting every vertex using the same rotational angle. Curved Lines: Curved Lines are rotated by repositioning of all points and drawing of the curve at new positions. 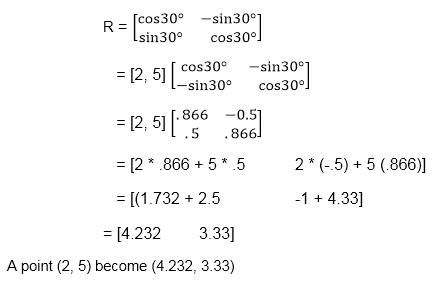 Circle: It can be obtained by center position by the specified angle. 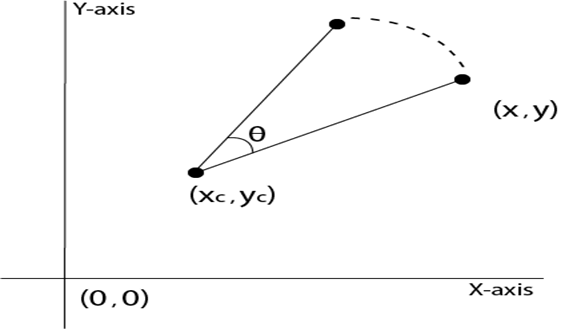 Ellipse: Its rotation can be obtained by rotating major and minor axis of an ellipse by the desired angle. Matrix for rotation is a clockwise direction. Matrix for rotation is an anticlockwise direction. 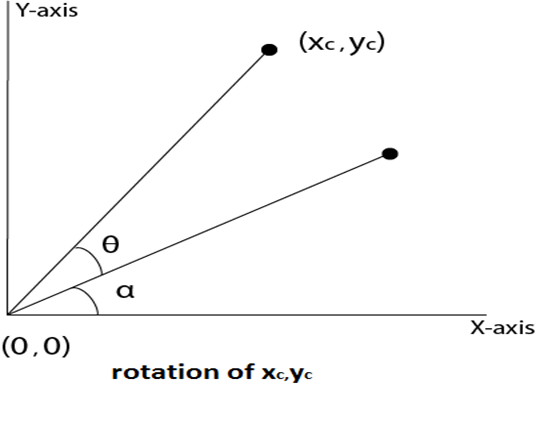 Rotation about an arbitrary point: If we want to rotate an object or point about an arbitrary point, first of all, we translate the point about which we want to rotate to the origin. Then rotate point or object about the origin, and at the end, we again translate it to the original place. We get rotation about an arbitrary point. 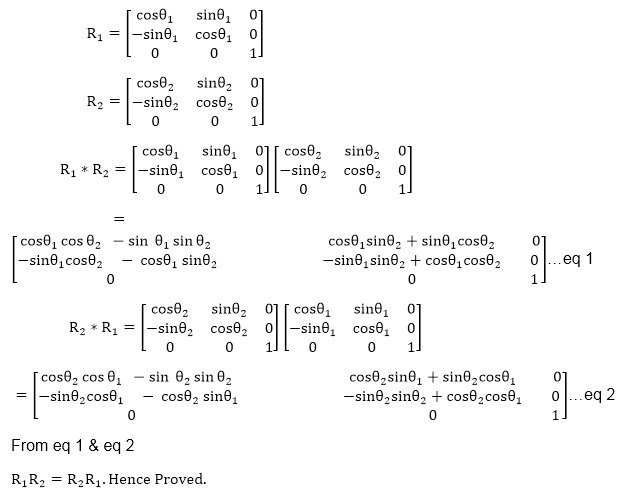 Example1: Prove that 2D rotations about the origin are commutative i.e. R1 R2=R2 R1. 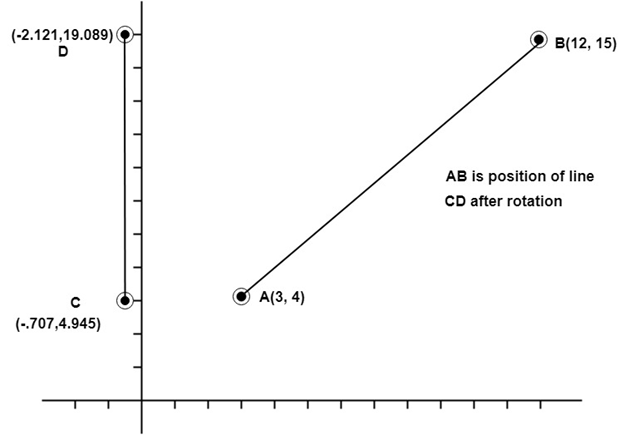 Example2: Rotate a line CD whose endpoints are (3, 4) and (12, 15) about origin through a 45° anticlockwise direction. 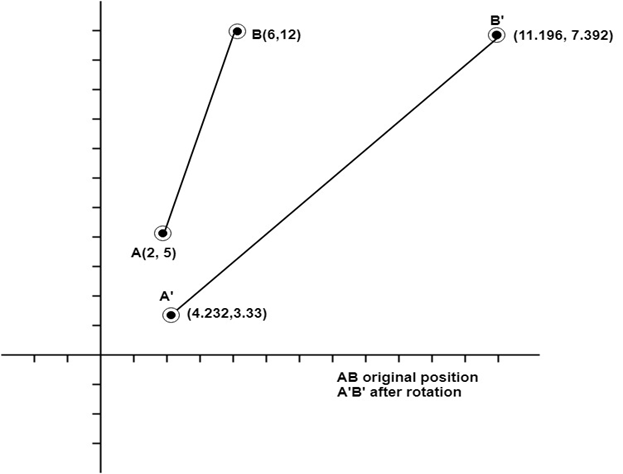 Example3: Rotate line AB whose endpoints are A (2, 5) and B (6, 12) about origin through a 30° clockwise direction.